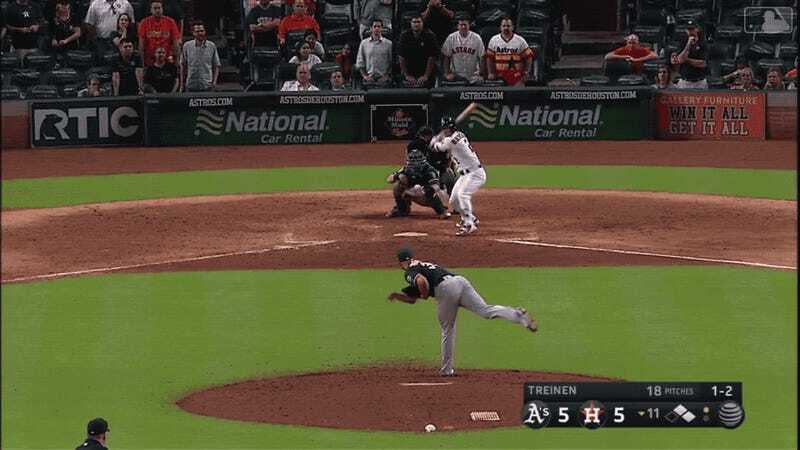 Alex Bregman drove in a run from second on a ball that traveled maybe five feet from home plate, and the Astros walked it off against the A’s on Tuesday night thanks to one of the dumbest and most random game-ending plays you will ever see. At the plate in the 11th inning with the game tied, Bregman’s swing drove the ball directly into the ground, where it spun into fair territory for his first stroke of luck. A’s catcher Jonathan Lucroy grabbed the ball and went to tag Bregman, but his butterfingers allowed the batter to escape an immediate out. Then, when Lucroy retrieved the ball and tried to throw to first to keep the game alive, his offline delivery allowed the winning run to score. Whether you want to blame God or Jonathan Lucroy for the A’s loss, you should treasure this play. It is so bizarre and so beautiful that we will probably never experience it again.